For those who may be unaware, the film titled “Paterno” has officially been released and can be seen on HBO and/or HBO.com, as well as Amazon.com Prime Video. I have posted the official trailer below, as well as a link to both the film’s IMDB.com page and its Wikipedia page. I have not yet seen the film but caught about 20 minutes of it earlier this month when staying at a hotel. I would have watched the entire film right then and there, but unfortunately I had to run out to a conference. The small portion that I was able to see has me very intrigued and dying to watch the film in its entirety. I don’t have HBO, but if I can watch it on Amazon.com, I will do so in the near future and post my thoughts here afterwards. Paterno centers on Penn State’s Joe Paterno in the aftermath of the Jerry Sandusky sexual abuse scandal. After becoming the winningest coach in college football history, Paterno’s legacy is challenged and he is forced to face questions of institutional failure in regard to the victims. Academy Award and Emmy Award winner Al Pacino (HBO’s You Don’t Know Jack; Scent of a Woman) stars in the film’s title role. Paterno is Pacino’s third HBO collaboration with award-winning director Barry Levinson, having starred in You Don’t Know Jack, which earned Pacino a Golden Globe for Best Actor and an Emmy for acting and Levinson an Emmy for directing. Pacino also starred in the title role in HBO’s Phil Spector, which Levinson executive produced. Levinson directs Paterno from a script by Debora Cahn and John C. Richards. To read the rest of this, visit HBO.com by clicking here. Today, Maryland defeated Penn State, 20-19. 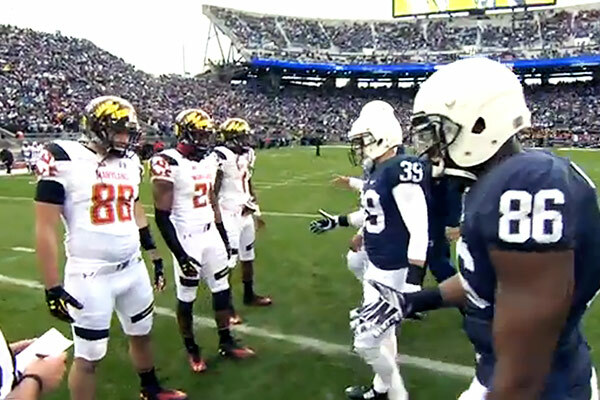 However, before the game, Maryland’s team captains refused to shake hands with Penn State’s team captains. I have watched a lot of college football in my life and I have never seen such a blatant act of unsportsmanlike conduct. It is my understanding that Maryland was flagged for this stunt, and I truly hope that was the case. I won’t rehash the specifics of the incident, as you can read about it on ESPN.com, ESPN.com (Big 10 Blog), SI.com, and BleacherReport.com (video). **Update: Nov. 3, 2014 – The Big 10 Conference has fined Maryland $10K for its pre-game behavior. You can read more about this fine / punishment at Yahoo Sports and / or SI.com. You can also read the Big 10’s official press release about this punishment at Big10.org (and I have also posted it below). JoPa was the last “great one” and there will never be another like him. With his death, we enter a new world of college football. Our connection to the past is gone, and with it another college football experience is forever unattainable. I once told a friend of mine that I was going to get on a plane and fly to State College, Pa. My whole purpose in going was merely to shake Joe Paterno’s hand. I did not want to take up his time or bother him for an autograph. I simply wanted to say that I had the honor of meeting Joe Paterno. I never did catch that flight to Pennsylvania. I was caught completely off-guard when I saw this story concerning the one year anniversary of Joe Paterno’s death. I can’t believe it has been a year since his passing. PHILADELPHIA (CBS) – Penn State athletic director Tim Curley will not return after his contract expires in June, according to a report from the Daily Collegian. Curley has been the athletic director at Penn State since 1993, but was placed on administrative leave when he was charged with perjury and failure to report suspected child abuse in the Sandusky case. PROVIDENCE, R.I. — Joe Paterno will remain in Brown University’s Athletic Hall of Fame. The Ivy League university announced Friday that an independent board that oversees the hall has voted not to remove the late Penn State football coach, who graduated from Brown in 1950. NOTICE: Click HERE for a PDF copy of the Freeh Report critique as prepared by Spanier’s attorneys.